The early days of television included a show called What’s My Line. The show presented three individuals, all of whom claimed to be a member of a certain occupation. Each of these individuals read the same statement about his, or her performance of the occupation’s main duties and responsibilities. After hearing the statement read by all three, three show-business folks could then ask questions to determine who was the real performer of the occupation, and who were the two imposters. After the questioning, the bottom line was: “Would the real Obama please stand up?” The suspense was killing, and the imposters often made the first move to stand up, the better to confuse the listeners and the panel. For those who have studied this presidency in detail, a variation of this same dilemma exists today in real life. The difference today is that the occupation is President of the United States, leader of the most powerful and free nation in the world. Exactly who is the real Obama? What does he believe in? What hope and change is on his agenda? Is his agenda compatible with the American Dream, the image of folks from around the world who flock to, or want to flock to our shores to become a part of America? 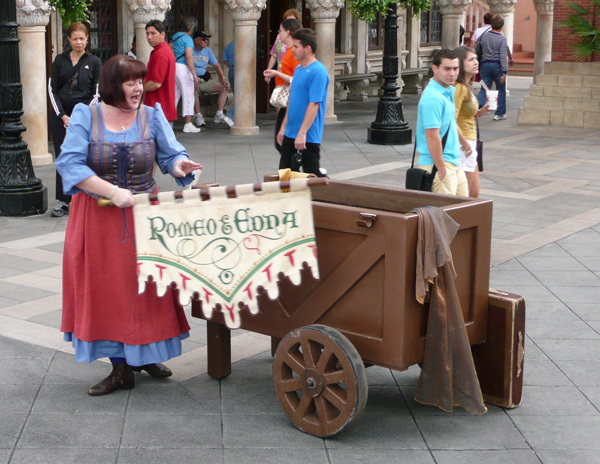 The above picture of a street actor in Disney World illustrates a widely held notion that the real Obama is either the street actor, who appears in public and makes speeches almost every day, or he is hiding in the cart and refuses to reveal exactly where he intends to lead the country until after his re-election. This is reminiscent of his remark to Putin that “after his re-election, he will have a freer hand to do what he wants.” Given what he has already done, it punctuates the vast discrepancy between his words and his deeds. One must view the words he utters with great care to determine whether he is the accomplished actor who is playing a role without substance in the real world, or he is hiding in the cart, attempting to achieve what he dare not say in public. Unlike the folks on “What’s My Line”, Obama plays all three parts, the president and both imposters, and he switches magically from one to the other under the distraction of his words. What follows is the clear documentation of this magnificent deception. Obama’s deception is clearly evident, and will become his legacy as President of the US. The greatest deception, and the one most damaging to the country, is his energy policy, or lack thereof. We are well along the way to becoming Europe with the doubling of gas prices and its damper on economic growth. The economy and the middle class lives or dies with the price of energy. Obama’s wind and solar power as the saviors of our future are pie in the sky fantasy. If fully developed at 100%, both sources would scarcely make a dent in the enormous demands for energy in our country. Neither is reliable or efficient enough for even a small percent of our needs, and Obama assures us of a policy of “sky-rocketing energy prices”. These are Obama’s own words. If you chose to ignore them, you do so at your peril. Sky-hi prices have already arrived, and are strangling the economy. Obama is in bed with environmentalists, who are thick as fleas on the dog, and care little for the dog. In the name of endangered species, a project employing dozens (or hundreds) of workers on a highway project was recently shut down because of a “cave dwelling spider”, suspected of being endangered. The spider was recovered from his cave, and was taken to an institution of higher learning for analysis. There the spider was dissected (killed) to determine whether, or not, it was really one of those who, presumably, was of the chosen. Consider the wisdom of this action. First kill the suspected endangered specimen. Stop work on the highway until the “habitat” is determined to be an endangered habitat. We may then pay those out of work unemployment benefits until the project is resumed, or until an alternate route is designed. This policy smells of the endangered darter snail in California, which has imperiled an entire fertile valley from growing food. Obama’s heavy foot on the throat of gas and oil production is well known. From the initial moratorium on drilling in the Gulf to the refusal to support the shale oil pipeline from Canada is adequate documentation of his energy dependence on others, rather than ourselves. Hydraulic fracturing offers a reasonably clean alternative to oil consumption, but environmentalists have little tolerance for anything below ground. Are we to become independent of others for energy, or must we continue to rely upon imports when we have virtually unlimited energy reserves at our disposal? Obama’s policies are killing the middle class, as these are the folks who lack the reserve to pay the extra dollars for energy to get to work. It was the outrageous cost of energy that precipitated the bursting of the housing bubble. It is the cost of energy today that continues to interfere with growth of the economy. When the cost of gasoline goes up dramatically, every American family must find a place to cut costs somewhere else. Economists appear completely unable to understand these simple mathematics. They appear to believe that if the government simply spends more money (which they have done with 5 trillion dollars in Obama’s first term) the economy will be stimulated to create jobs. This is unadulterated B.S., particularly when performed with borrowed money. Obama’s treasury guru’s believe in the magical multiplier effect of government spending. Select members of his band of economic idiots even believe that food stamps and unemployment benefits have the greatest benefit of all. When spending borrowed dollars, a dollar of debt has only 60 cents of initial purchasing power, as the rest of the dollar is diverted to interest payments on the debt. Go figure. No doubt the man on the street has a better grasp on economic reality than those in Washington. This level of economic idiocy is reminiscent of the dot-com bubble in the 1990s. Many of the folks, with a critical mass in California, believed that making profits in a technology company was completely unnecessary. Profits didn’t matter, and indeed most of the dot-com companies made no profits and paid no taxes as a result. When the bubble burst it was only those with surplus cash from profits that survived. The rest were living on “paper money” which was only worth the paper it was written on. The dot-coms were living on investor money, IPOs, and growth in “market value” as reflected in its stock price. When the walls came tumbling down, like Enron’s house of cards, there was nothing left of the company beyond the contracts that proved to be worthless. With five trillion dollars of borrowed money spent beyond government revenue since Obama took office, if the multiplier effect really worked we would all be rich. When America’s wealth is destroyed there will be nothing remaining to redistribute to those “who need a shot”. At that point, America’s wealthy will have nothing to invest in America’s future, and we will join the other nations groveling in poverty. Without a productive class, as described adequately in Atlas Shrugged, there is no investment in the country’s future. Redistribution at that point will have served its purpose, as nothing will remain to redistribute. When the government seizes, or destroys a country’s wealth, we will all be slaves to the politically elite. Then we will all be wishing for a smaller government? When the real Obama emerges America’s remaining wealth will be destroyed, and there will be no incentive left for folks to get ahead through their own efforts. This kills the American Dream in the name of a street actor whose national loyalty is completely missing. As our first half-black president, he had everything going for him. A continuation of his policies will kill America’s Golden Goose. Wake up, America. Obama is not our savior!